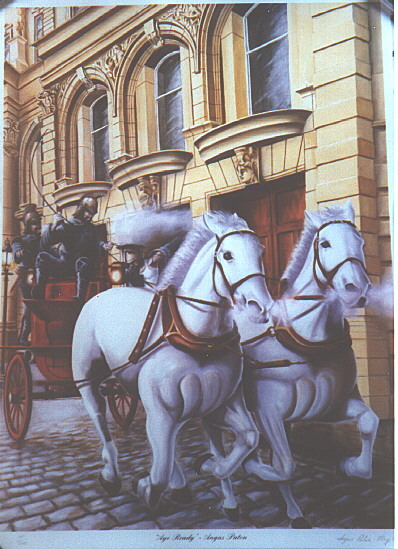 Firefighter Gus Paton a self taught artist stationed at Greenock Fire Station has painted a horse drawn steamer leaving the old Greenock fire station in the municipal buildings and donated it to Strathclyde Fire Brigade who will hang it in their headquarters in Hamilton. As a fund raising venture a limited edition of 1,000 prints have been made of the painting and will be sold at £25 each plus postage. All cash raised from the sale of the prints will go to the Fire Fire Fighter's Charity. by emailing him at David.Adam@firescotland.gov.uk or phoning him at 01505 614379 mobile 07789 923449. This is a photo of the print which shows almost all of it but is a wee bit squint. Gus painted a second painting in 2007 again for the Fire Fighter's Charity. Below is Gus with the second painting. This print can also be obtained from David Adam.